Handshake is an act of shaking your hand with someone else’s. There can be many reasons for handshake such as greeting, saying goodbye or when you have made any agreement. Handshake is not only used for greeting purposes but also to express power, confidence and professionalism. Although, it is known as a small gesture, it is very much capable of breaking or making a relationship right from the beginning. This small gesture conveys a lot about your personality to the other person or a lot about other person to you. Handshakes are classified into different types on the basis of meanings or gestures they convey. Each and every type of handshake is associated with some sort of positivity or negativity. These different types will help you understand the different types of handshakes well to enhance your personality impression while shaking hands with other people in a more confident way. Hand Hug: Hand hug is a type of handshake which is much more common with politicians. In this type of handshake, one opts to wrap the hand shake with left hand. In its true sense, the hand hug conveys the meaning of warmness, friendly, honest and trustworthy. If the people are very close, they make the pile of 4 hands expressing their extreme loyalty and warmness. There is another less popular variety of hand hug where the people use their left hand to hold the elbow, bicep, forearm, or shoulder while shaking hands. The position of the arm shows the intimacy between the two people such as higher the arm stronger is the bond between them. Dominator: It is believed that if someone displays his/her palm downwards while shaking hand, it conveys the meaning of authority or superiority. Occasionally, you have often noticed people while shaking hands that their hand is on the higher position with their palm pointing towards the ground. 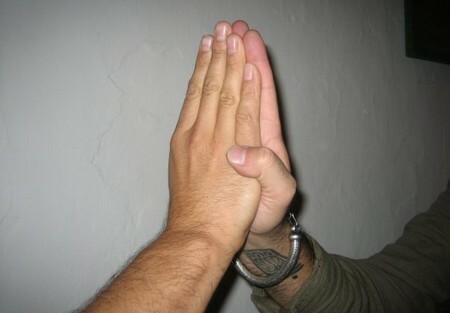 It is an important type of handshake which becomes really helpful in several different situations. For instance, in your workplace keep your hand down while shaking hand with your boss to make your boss superior or in case you want to express your regrets over something, keep your palm down. This is can sometime bring great advantages for you. Cold and Clammy: Perhaps, you have experienced this type of handshake before but may not aware of it. 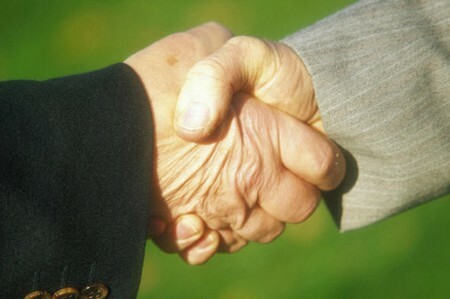 It is a type of handshake where the person with whom you are shaking hand has a cold sweaty hand. This sort of situation is often connection with passive or indifferent people expressing lack of energy and weak character. This situation can also be associated with nervous people in which the blood circulates away from the cells under palm flow to other parts of the body. These nervous people feel odd while shaking hand or meeting with people, usually strangers. However, beside these factors one should keep this fact in mind also that there are few people who are suffering from Hyperhydrosis – a medical condition where patient experience undue sweating. Crusher: Crusher is a type of handshake where some people with a view of showing confidence and power, make your knuckles feel grinded against each other during shaking hands. Such people are excessively aggressive which depart leaving your hands in numbing pain. However, the pressure determines the intentions of the person. Some people apply slight pressure while shaking hand to express the dominating personality occasionally. They done this out of curiosity as they feel other person may show his/her dominance. Queens Fingertips: It is a type of handshake wherein the encounter is in between a male and a female. Due the fact that women are more concerned about keeping personal space, they usually stand at a reasonable distance and extend out their hands in a view that the person hardly grasps two or three fingers and that too without a firm grip. This sort of handshake is also common among the people who are superior or higher in rank to other individuals such as The Queens. Keep Back: It is another type of handshake which is attributed to the aggressive class wherein the person in order keep its personal space and prestige lean forward to shake hands with you. The major reason may be the distance that they want to retain while meeting someone for the first time. This type of handshake can also be noticed among the people belong to the rural areas. Possibly the people brought up in rural areas require much more personal space than those in cities. Yank and Pull: Yank and pull is a type of handshake wherein a person grasps your arm and grab you closer towards him without caring for his personal space. It is assumed that there can be three major reasons for doing this: firstly, the person may be feeling insecure and feel comfortable in your presence; secondly, they may belong to the region where the concept of personal space is different, to say smaller personal space; and finally, they might want to show their dominance. This behavior is not often acceptable by the majority because they feel that the other person may be over aggressive and showing a controlling nature. These are some of the different types of handshake. Handshake is an important gesture which usually lasts for 3 to 6 seconds. A proper handshake involves an equal balance from both sides and you need to exert an equal amount of pressure that you are getting from the other person.